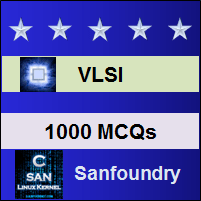 This set of VLSI Multiple Choice Questions & Answers (MCQs) focuses on “System Delays”. 1. Which provides large capacitance? Explanation: Bus wiring capacitance Cbus provides the largest capacitance for a typiccal bus system for example for small chips this can be as high as 0.8pF. Explanation: Bus wiring capacitance is driven through pull-up and pull-down transistors and through atleast one pass transistor or transmission gate in the series. 3. What is the delay of input pads? Explanation: Input pad always contains over voltage protection circuitry and Schmitt trigger circuitry. Its total delay is 30Ʈ. Explanation: The total delay for select register is 73Ʈ. It is the sum of delays of input pad, three pass transistors and driver inverter pair. Explanation: Data is propogated through bus. Bus can be bidirectional but at data can be propogated through bus only at one direction at a time. The delay for this data propogation is 100nsec. 6. Which is the longest delay in adder process? Explanation: The longest delay in the adder process is the carry chain delay. This is the process of forming carry out which propogates through all bits of the adder. Explanation: The total delay for the adder process is 220 nsec. The total delay is the sum of select register delay, bus delays and carry chain delays. Explanation: The clock 2 which is the refreshing clock should propogate through wiring and finite rise and fall time must be allowed. 9. The value of Ʈ for 5 micron technology is always constant. Explanation: The range of value of Ʈ for 5 micron technology was calculated to be 0.1 to 0.3 nsec but it may vary upto 0.6 nsec. Explanation: The total clock period of the adder process is 250 nsec which is the sum of all the delay (220 nsec) and thee period of different phases of the process.